When apples are in season there is nothing more impressive than a Classic French Apple Tart Recipe. It’s a dessert that is as pretty as it is delicious! 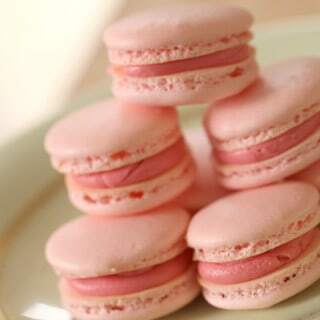 It’s easier to make than you might think, and guests always think you bought it at a fancy French bakery! 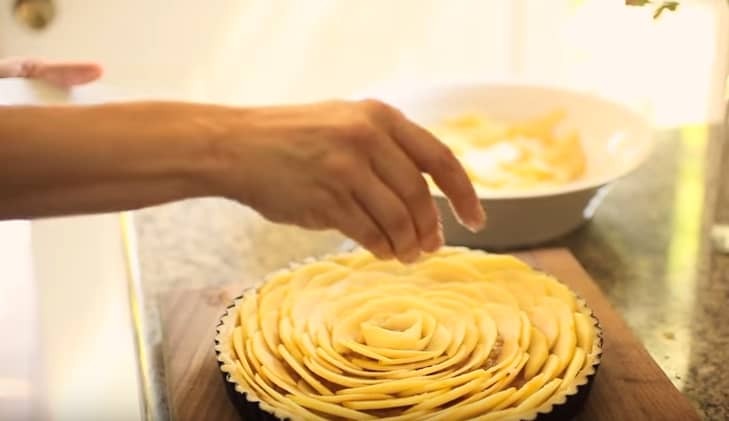 For a step-by-step tutorial on how to make this French Apple Tart Recipe you can watch my video below. In a food processor (This link goes to Amazon where I am compensated for products sold) you will combine flour, salt and sugar, then slowly add butter until a coarse meal forms. You’ll add an egg beaten with ice water and a dough will form. Press it into a disk, wrap in plastic and refrigerate for at least 1 hour. 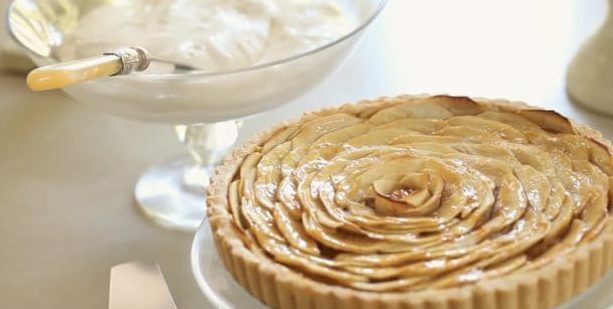 The second step to this French Apple Tart is making the apple compote which adds a wonderful sweetness and interest to this tart recipe. The best type of apple to use is a Gala apple. 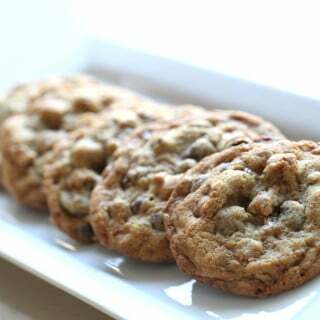 They are sweet and light and don’t need much cooking time to bring out their sweetness since they were sweet to begin with. Cook the apples in a heavy-bottom sauce pan with sugar, cinnamon, lemon juice and apple juice for about 10 minutes. Once they are tender, mash them up with a fork until a coarse compote forms. The arrangement of the apples is really what makes this dessert a true “showstopper”. 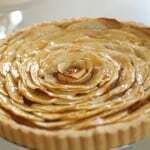 How Do You Slice Apples for a French Apple Tart? The apple slicing is key for making sure that all the apples are roughly the same size. The best way is to cut off the sides of the apple. 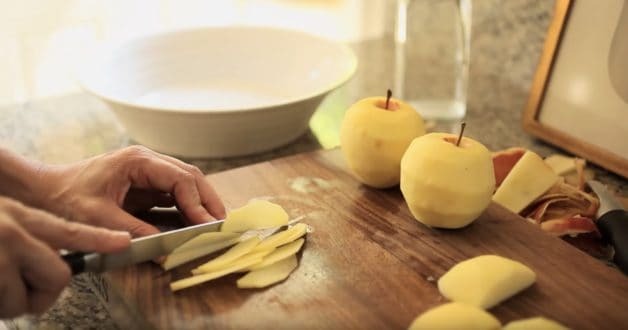 This also makes them easier to core since by slicing the apples this way you’ll be left with a square core. 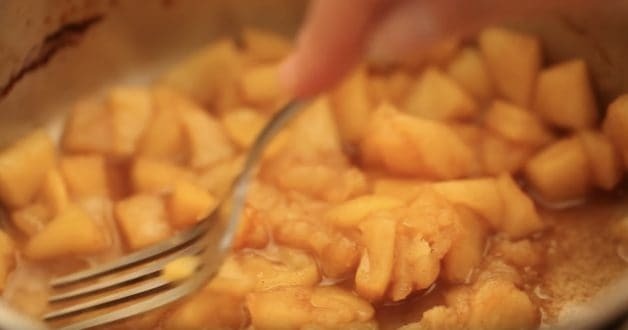 Place each of the four apple sides on their flat side and thinly slice apples so that each piece is about 1/8″ thickness. TIP: It helps to do this with a slightly serrated knife. It grips the apple in a way that helps to create uniform slices. Fit your tart tin with the pastry dough and trim the edges flush with the tin. TIP: Make sure your compote has completely cooled before doing this or it will melt your chilled pastry. 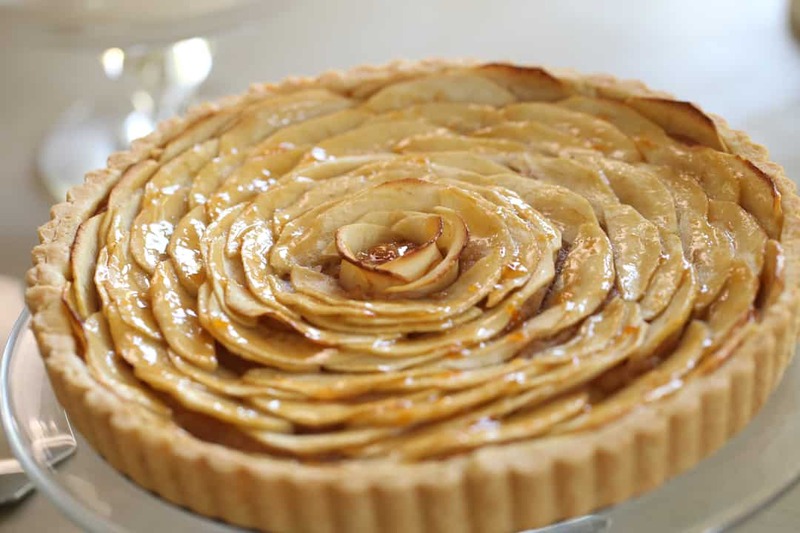 Begin at the outer perimeter of the tart, adding apple slices all around the tart slightly overlapping and assuring they are the same height. TIP: You can slice of the flat bottom part of the apple slices to make them shorter if need be. Continue adding apples staggering each row to create a more decorative design. Once you get to the center you’ll have a small hole. Then fill that hole with 2 paper-thin apple slices, slightly bent in opposite directions. This will create the illusion of a decorative rose in the center. Then sprinkle white sugar on top to caramelize the apples when they bake. 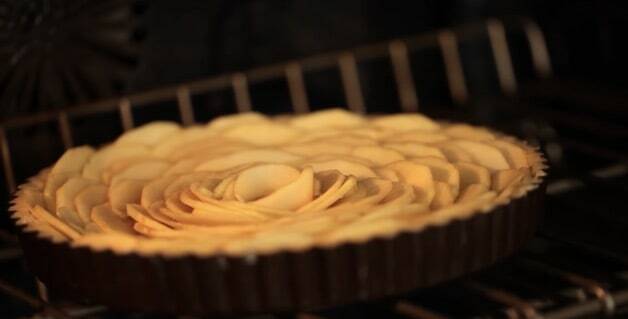 You’ll bake the tart at 400F to begin, this will set the pastry, then reduce to 350F to continue baking. The mark of a classic French Apple Tart is the shinny topping. This can be achieved by heating apple jelly or apricot jelly in the microwave and then brushing the tart with it after it’s baked. I prefer the apricot jelly because I think it adds a nice sweet-tart flavor on top. Just be sure to get the jelly (which is clear and smooth) as opposed to the “jam” which is too chunky for brushing. Can You Freeze a French Apple Tart? Personally, I wouldn’t freeze it since the apples don’t do so well when thawed out. Make sure to follow us on Youtube, Pinterest, Instagram, Facebook & Twitter! 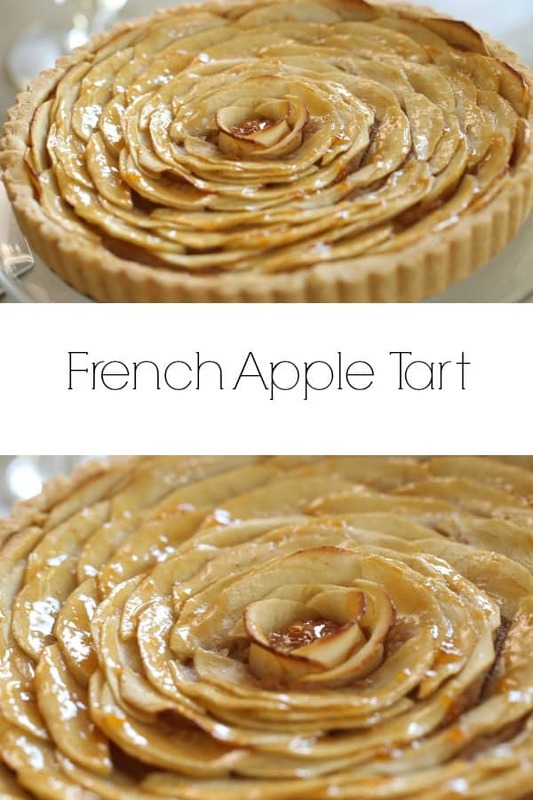 Impress your friends and family with this classic French Apple Tart Recipe perfect for entertaining. Much easier than it looks! 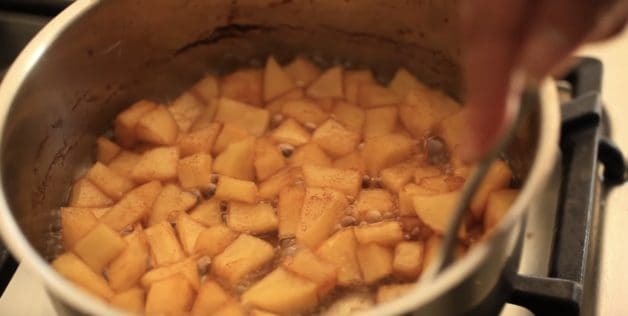 Meanwhile, place apple chunks, sugar, juice, water cinnamon and zest in a heavy-bottomed sauce pan. Cover and bring to a boil and let cook for 10 mins. Simmer uncovered until most of the liquid is evaporated. Mask apples into a paste with a fork. Allow to cool completely, it will thicken as it cools. 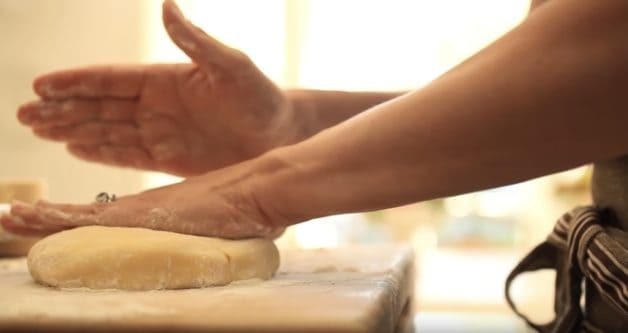 Roll out dough onto a floured surface and fit into a 9″ tart pan. Spread a single layer of compote on the bottom, and place in freezer while you prep your apples. Peel, core and slice apples very thin, about 1/8 ” thick. Place in bowl and squeeze with lemon juice to prevent browning. Remove tart from the freezer. When placing the apples the idea is to create an escargot pattern. Starting from the outside and working your way into the center. 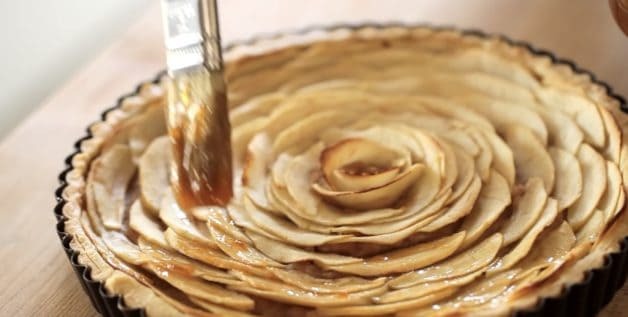 Layer each apple, cut side down, one slightly overlapping the other, making your way all around the tart until you reach the center. Bake at 400F (200 c) for 15 minutes and then reduce heat to 350F (175 c) and bake for 20 more minutes, or until golden brown. Then place under the broiler for 1-2 minutes just until the apples begin to get lightly charred. Place the jam in the microwave and heat on high for 15 secs or until melted. Brush tart with jam to create a nice shine. Et voila! 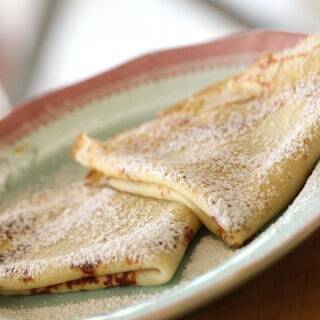 Serve with vanilla ice cream or a dollop of homemade whipped cream. For whipped cream place all ingredients in the bowl of an electric mixer and whip on high until soft peaks form. Make sure your compote has completely cooled before doing this or it will melt your chilled pastry. 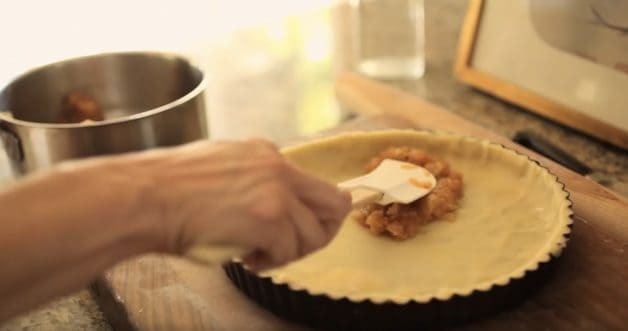 Starting at the higher temperature allows you to skip the “blind baking” step with this tart and prevents your tart shell from shrinking too much. Just remember to reduce the temperature! Can the compote be made ahead of time? Can the dough be made ahead and refrigerated for a day or two? Also I could only find am 11 inch tart pan will this be enough dough? 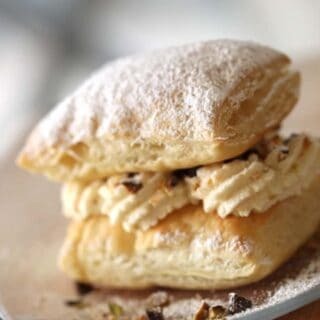 Hi, have just found you and love the videos and recipes. 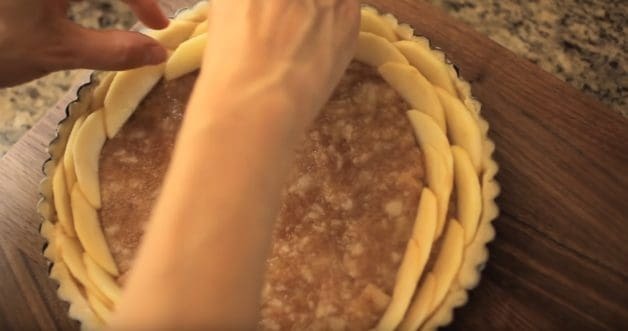 Is this apple tart good for freezing? So glad you found me! Welcome! I wouldn’t freeze the whole tart but rather freeze the dough and the compote and then assemble and bake when needed. I think freezing the whole tart might make it too soggy when thawed. Hope you enjoy! Just FYI (and you dont need to approve this comment) 🙂 But there’s sugar in the ingredient list for the compote but it’s not listed in the directions. No biggie…just making sure you knew! Oh so sorry about that! Thank you for letting me know, I’ll fix that ASAP! 🙂 Happy Baking!